It is Bali's largest Buddhist monastery located near the village of Dencarik. The monastery is absolutely charming and commands lovely views. Whilst obviously Buddhist with its orange roof, numerous gold Buddhas and stupas recalling those at Borobudur, the carvings and ornamentation are very Balinese. The combination works well and if it were in a location easier to reach, this attraction would recieve far more visitors than it does. 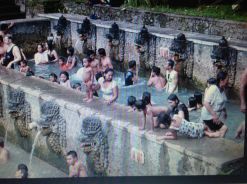 A visit here combines well with Banjar Hot Springs.